A Brahmin (Priest), whose profession was singing the glories of the Lord, was once reciting Srimad Bhagavatam in the house of a patron. A thief broke into the house where the recital was going on and hid himself in the deep corner. Perforce, he had to listen to Srimad Bhagavatam (Beautiful stories & Miracles of Lord Krishna). The singer was now describing the ornaments worn by little Krishna. He described the various ornaments Mother Yasoda decorated on little Krishna before sending Him out with the cows. The thief was excited and thought that he should meet that lad and rob all the ornaments at one stroke instead of struggling every day with petty stealing. He waited till the entire chapter of Srimad was recited and left the place. The thief wanted to know where this boy was. He, therefore, followed the Brahmin and waylaid him. The Brahmin was frightened and feared that he would lose even the small amount he had received as dakshina and told the thief, “I do not have anything with me”. The thief believed the Brahmin and set out for Brindavana immediately. He located the beautiful place, climbed up a tree and waited for the boys to arrive. The sun rose. Faint melody of the flute wafted along the morning breeze. The enchanting music could then be heard closer and the thief spotted two boys coming. He got down from the tree and went near them. The moment he saw the most beautiful appearance of the little Krishna, he forgot himself, folded his hands and shed tears of joy. The tears were from his heart and it was chilling. He wondered which wretched mother had sent these radiant boys, chiseled to perfection, loaded with ornaments to the riverbank. He could not take his eyes off from the divinity. The transformation started. He approached the boys shouting, “Stop,” and held Krishna’s hand. The moment he touched Lord Krishna, all his previous karmas were wiped out like a ball of cotton getting burnt in fire and with all humility he inquired lovingly, “Who are you?” Krishna looked at him, innocently and said, "I am frightened by your looks. Please leave my hands”. The thief, now full of remorse, said to Krishna, “It is my evil mind which is reflected in my face. If you are frightened, I shall go away. Please don't say, I must leave you". Krishna with a smile said, “Do not worry about that. I have plenty of them. I am a bigger thief than you. But there is a difference between you and me – however much I steal, the owners do not complain. I am lovingly called “Chitta Chora”. Though you are not aware of it, you have a previous ornament in your possession, the “Chitta (Heart)”. I shall steal it now and take the same with Me”. So saying both the boys vanished. To his surprise, the thief found a bag full of ornaments on his shoulder. He brought it to the Brahmin’s house and told him what had all happened. The Brahmin was now frightened and took the thief inside and opened the bag. To his utter amazement he saw all the ornaments described by him as being worn by Krishna in the Bhagavatam, in the thief’s bag. Shedding tears of joy, the Brahmin asked the thief to take him to the place where he saw the dark boy. The thief obliged and both of them waited in the same place where the thief accosted the boy the previous day. Khaparde came along with Bal Gangadhar Tilak, to Shirdi on 19 May 1917. Khaparde who had come earlier also to Shirdi, had seen the greatness of Baba personally. Hence, he brought Tilak who was the extremist leader in the Indian National Congress and a freedom fighter, to have darshan of Baba and take his advice in the matter of freedom movement. There were proofs that Baba gave Tilak certain advices secretly. According to the then prevailing conditions under British rule, these matters were kept secret. 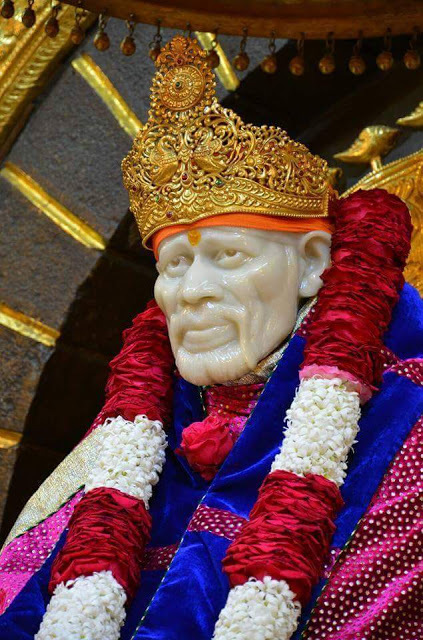 After Tilak left Shirdi, then District Collector of Ahmednagar sent a CID Officer to Shirdi to keep an eye on the activities of Sai Baba and send a confidential report. There were several proofs to show that Baba predicted that India would certainly become an independent nation, through a non-violent revolution only and not through extremist violent acts. He gave advice to Tilak along the above lines and there were indications that from that day the extremist actions were toned down"
On this day let's envision Sai baba s hints about the independence and also salute our sadhguru Sai and our beloved soldiers who brought independence to us.